Link to the #FT website. The arrival of Derek Gardner at the Tyrrell Formula One team in 1970 as technical director produced a series of outstanding successes. These included Sir Jackie Stewart winning the F1 drivers’ championships in 1971 and 1973, as well as Tyrrell’s triumph in the constructor’s championship in 1973. F1 regulations were looser than today and teams continually tried radical new ideas to help catch up with the top performers. By 1974 it was evident that Ford, which powered the Tyrrell car, was complacent in the face of the new 12-cylinder engine of Ferrari and Matra. As Gardner put it, Tyrrell needed a big breakthrough or it would risk being “hopelessly outclassed”. With Ford not undertaking any significant development for its engines, Gardner decided an alternative was to design smaller front wheels, which would reduce lift and increase speed. But this would threaten the car’s grip during turns and its overall stability. Gardner returned to a striking design he had developed before, but not applied, to solve instability problems. The Tyrrell P34, a pioneering six-wheel car with four smaller front wheels and two standard-size rear wheels, improved downforce and grip, and significantly increased the car’s cornering speed. Persuading Tyrrell’s team and suppliers to support such a radical innovation was a struggle, but the P34 eventually made its jaw-dropping debut in the 1976 season, as the first six-wheel car. The Tyrrell P34 threatened to dominate F1 – but only for a short period. Four races after its debut, Jodie Scheckter and Patrick Depailler finished first and second in the Swedish Grand Prix. The season ended with Tyrrell coming third in the constructors’ championship, with Scheckter and Depailler third and fourth in the drivers’ championship. However, Tyrrell had not considered the critical importance of Goodyear, the official tyre supplier for all F1 teams. The tyremaker had agreed to custom-make one “small-size” model for Tyrrell. But it turned out that Goodyear was not prepared to continue development of the size. 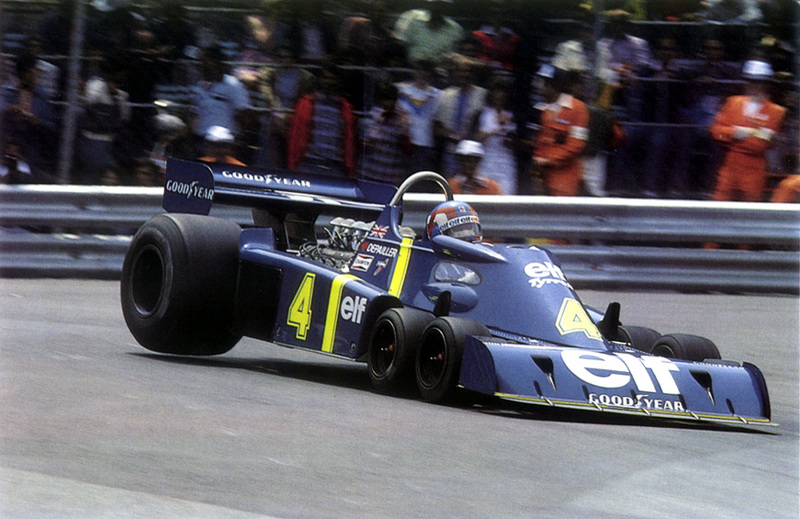 For the tyremaker, there were not enough economies of scale because Tyrrell was the only car using small wheels. It judged that the research and development costs were too high to be covered by just one team. Tyrrell failed to persuade Goodyear that, if the six-wheeler was consistently successful, other teams would adopt the design. The tyremaker was also unconvinced of the wider potential of the design. While Goodyear worked on improving the standard tyres on all F1 cars throughout the 1976 season, it did not work on development of the bespoke P34 front tyres. As a result, the Tyrrell car’s rear tyres became faster and more durable, while the P34 front tyres did not. The disparity undermined the car’s balance and made it almost undriveable. In addition, the front brakes suffered overheating problems because of limited ventilation inside the small front wheels. Eventually, Tyrrell abandoned the P34 project. Scheckter moved to the Wolf F1 team and Gardner – one of the most acclaimed and inventive F1 designers – resigned from Tyrrell and turned his back on F1 for good. Just because an innovation is exciting, it is not guaranteed market success. Tyrrell’s P34 experience confirms the critical importance of strategic suppliers to executing innovative ideas. In highly technological environments, the outcome of an innovation often depends on several parties’ support and involvement. Businesses must engage with their most important suppliers when innovating. The six-wheel concept was an effective idea, and although it vanished from F1 – six-wheelers were subsequently banned when the sport introduced more design restrictions – the idea now has several applications, such as all-terrain vehicles, vans, buses, trucks and Covini sports cars. If Tyrrell had persuaded Goodyear to support the P34, we might all be driving cars with two extra wheels today. Enzo Ferrari once affirmed that he did not sell cars, but engines. He threw in the car for free since something has to hold the engines. This might sound a bit extreme, but somehow proves that engines have always been a paramount component in car performance, especially when it comes to motor racing. F1 history shows that Honda’s success in engine supplying was definitely not replicated in team management, as these are activities that require a completely different set of technical as well as soft skills. However, being a world leading car manufacturer, Honda cannot stay out of the huge technological revolution that F1 is pushing, whose outcomes of hybrid and – more in general – efficient engines have started to be applied in the automobile industry. Looking at balance sheets, F1 racing might not look as a very profitable business, but the returns in research and development provide a source of competitive advantage for all the firms who are able to transfer the innovations to other industries. Since both McLaren and Honda have a stake in the car market, it would be interesting to see whether this alliance will be replicated in the automobile industry too, and how this will influence their race strategies. Once again Ferrari, one the wealthiest, most experienced, and most awarded teams took a wrong decision during a critical situation, and paid an outrageously high price for it. Fact. Alonso nudged Sebastian Vettel’s Red Bull at turn 2 on the opening lap, damaging the Ferrari’s front wing. The team left Alonso out, waiting for the chance to change to dry tyres, but the wing failed completely at the start of lap two, putting the Spaniard out (source: Autosport). Result: since Massa could not do better than 5th place, Ferrari lost its first position in the classification and it is in second position with 40 points (same as Lotus) while Red Bull leads with 66. Concerning the Driver Ranking, Vetter leads with 40 points, while Alonso – only 6th – has gained to date only 18 points. Claudio Domenicali, the number one at Ferrari’s pit wall, takes responsibility for the “unfortunate” decision and says it was a team’s choice not to call Fernando Alonso in to repair a damaged car early in the Malaysian Grand Prix. “We took a risk that didn’t pay off (…) The ‘kiss’ [on Vettel’s car] was unfortunate because we could have taken good points from this race” (source BBC). Domenicali diplomatically called this decision “unfortunate”. I prefer calling is with its proper name “a gamble: senseless, unnecessary, and strategically wrong.” One might argue that this is the kind of situation that, in case of a lucky strike, a F1 amateur would consider as a brilliant strategic decision. As an academic strategist though, I will try to define why this decision was objectively a hazard, as it was based on wrong basis and scientifically failing reasoning. By explaining this, I will point out the paramount difference between strategy and tactic, and why the former in this case should have been a priority compare to the latter. Decision making is not a matter of scientific certainties, but still strategists should follow a scientific approach through their analysis and decisions to the best of their possibilities. This means analyzing the available data and not taking the the decision with the most likely positive result, rather than an unlikely decision with the highest possible outcome. It is a fact that, despite the terrific amount of information from telemetry, in F1 there is no way to objectively assess the gravity of crashes on parts of the chassis. The only thing that the people from the pits can do is checking the speed, looking at the videos running on their screens, and trying to figure out how bad the crash was and how long the vehicle could hold. Asking the driver for his sensations might be on the one hand a good decision, but it might be highly misleading too since – as for the front wing – the driver cannot see that section of the car from his seated position. As soon as Alonso hit Vettel it was clearly visible that one front wing pillar was broken and the front wing was dragging along the ground on the left-hand side. There was no way to measure how long that precarious situation would have hold, but even from a semi-layperson standpoint I can affirm it looked pretty bad, and as Ferrari thinking heads had no way to get better measures than this on its resistance. Hence, it would have been the right decision just to tell Alonso to stop and change the front wing as soon as possible. No data means no information, and taking decisions without any proper and reliable measurement is nothing better than gambling. There can be situations – such as the final race of a still unresolved seasonal battle – where strategist might need to go for a “all or nothing” decision in order to finish the season ahead of the rival, but this is not the case of the Malaysia grand prix, the second race of the 2013 season. At this point having Alonso finishing the race and avoiding the risk of scoring a miserable “0” – as he did later – offer a lot of advantages that needed to be taken into consideration. First, at the beginning of a season cars are still in development process. Teams know little about their vehicles, and since testing is now capped for all teams, each additional mile raced brings an added value derived from the data the teams collect and the technological insights they can derive from this. Having Ferrari’s best driver out at the second lap is a situation to be avoided at any cost at the beginning of the year. Second, Ferrari has recently proved to be a strong but emotional team, which suffers having to chase competitors’ performances rather than defending a leading position in the ranking. For this reason it is important to keep the gap between Red Bull at a minimum, and thus avoid the psychological pressure for results that negatively affected Ferrari at the end of the last few F1 seasons, thus probably contributing to unsatisfactory results for a team whose ambitious cannot be satisfied with a silver medal. Finally, leading strategists should have clear in mind that strategies are related to long term results, while tactics are for short term goals. When aiming for a short term result might affect the long term achievement, leaders should know that strategy needs to be prioritized, as tactic might create myopic behaviors, and ultimately failure. I agree with Gary Anderson from BBC saying that “Ferrari have made a string of strategy errors in the last few years and you have to say there is a wider problem there that needs to be addressed. It wasn’t as if it was a snap decision – it happened at the start and the first lap is nearly two minutes long.” I notice how Ferrari is now minimizing such outrageous mistakes, which I believe makes the decision to replace Chris Dyer as head of race track engineering for his mistake which cost Alonso the 2010 drivers title in favour of Sebastian Vettel look like a scapegoat execution, rather than a serious (and necessary) attempt of honestly assessing Ferrari’s current strategy skills, and working hard for a significant improvement. 1. Did Kimi and Michael restarted from a similar base in terms of health, age, and psychological expectations? 2. What was the price to pay in case of a failing comeback for Michael? What would be the price for Kimi? Might this different psychological set up have worked as a motivational incentive, or rather as a oppressive anxiety for the two champions? My personal (and probably wrong) idea. Michael Schumacher is a living legend for motorsport. At Ferrari (and in general in Italy) he was worshipped as a semi-god. When he came back he was older than Kimi, he had back problem, and he was stepping from a top-team where he ruled an undiscussed king (first as driver, and later as consultant and tester) to a underdog car. It was a huge risk, a very criticable decision, and the likelihood of failure was huge. I actually wonder if he really ever believed he could make a real impact, given these premises. Kimi is a good driver, an enjoyable character, but not a legend. He came back while he is still relatively young, and with a very promising team. He feels the weight of some expectations, but I believe that is not a huge burden in his case. If it goes well, great. If goes bad, it’s not a tragedy: there’s no legend to tear apart. And the likelihood of doing good are much higher than the ones Schumacher had. Schumi vs. Kimi – Who had the better comeback? When most people retire from their profession, they often spend their time watching Countdown and waiting to die. Rarely will someone get so bored of retirement that they decide to leave Countdown behind and head back into their old job. Formula One however, is a different matter. In 2010, after four years away, seven time world champion Michael Schumacher returned to the sport as part of the Mercedes AMG Petronas team alongside fellow countryman Nico Rosberg. Two years later in 2012, former world champion Kimi Räikkönen announced his plans to return to the sport as part of the Lotus F1 team. Last weekend the Australian Grand Prix has officially started the 2013 Formula One season. Raikkonen won the gran prix with an unexpected two stop strategy, while the others main competitors opted for three. After one race, Raikkonen (Lotus) leads the drivers’ world championship with 25 points from Alonso (Ferrari) on 18, Vettel (RedBull) on 15, Massa (Ferrari) on 12, Hamilton (Mercedes) on 10, Webber (RedBull) on 8, Sutil (Force India) on 6, Di Resta (Force India) on 4, Button (McLaren) on 2 and Grosjean (Lotus) on 1. Ferrari leads the constructors’ points with 30 to Lotus’s 26, Red Bull’s 23, Mercedes and Force India’s 10 and McLaren’s 2. It is, of course, far too early to draw any conclusion on what is going to happen in the remaining 18 races. Still, if taken alone, the Australian GP does give us some general lessons – or at least hints – on motorsport strategy we could discuss. First Lesson: strategy is about consistency. In the end, paraphrasing what Fernando Alonso said, it is more important to have a perfect weekend rather than being the fastest car on track on Sunday race. Success comes from a consistent path of development and results that starts on Thursday and gets its climax on Sunday. One can win one race because of chance, but to win a championship teams need consistency and continuous improvement throughout the season, for both drivers. Also, in causality terms, the best way to be the fastest on Sunday is being consistently performative during the previous days. Second lesson: strategy is about surprising. After so much talking of the quicker degradation of the new Pirelli tyres, it seemed obvious that there was an opportunity for better grip, and thus developing faster cars compared to 2012. So all the teams – but Lotus – gave for granted that the magic formula was getting car performance to the limit, changing tyres 3 times per race. However, Lotus surprisingly proved that it is possible to reach the highest podium with a fast-but-not-so-fast car if this features a “tyre preserving” set up. Even the lords of speed Alonso and Vettel racing on the renown prancing horse or the red bull could not do much about it. After the surprise of discovering that Lotus can do pretty well changing tyres only twice, I wonder if Ferrari and Red Bull will try to imitate the two stop strategy, of push toward a even faster car. Third lesson: strategy has different measures of performance. Apart from the unexpected Raikkonen’s fastest lap just before the end, Lotus was on average not the fastest car of the weekend, and the successful results is due to the golden arrow’s two stops strategy, rather than a series of exceptional lap times. “It was the best start we could have had to the season,” said Lotus Team Principal Eric Boullier. “Not only is it a win, but the strategy we chose also worked. Reduced tyre wear was one of the strengths of the car that we inherited from last season and it was useful because during Kimi’s second stint the other cars were starting to challenge a bit more.” (source Bloomberg). Somehow, reliability paid-off more than speed, and Raikkonen’s posted the fastest lap on the second-last circuit, when we could expect his tyres to be pretty much worn out, demonstrates that Lotus has also potential to further improve its average lap time as well. When teams look at performance, speed is not the only – and not even the main – measure to keep under control. Reliability can be a great performance measure, if combined with the right strategy. These are three lessons I have learned, but I am curious to see what the teams have learned next weekend in Kuala Lumpur, Malaysia. Cass Talks Episode 154: Could too much innovation hold Formula One teams back? Dr Paolo Aversa, Marie Curie Research Fellow of Strategy at Cass Business School, discusses how too much innovation could hold Formula One teams back. Can the power of smaller teams’ creativity counterbalance of the benefits of top teams’ better resources in F1? Read Prof. Mark Jenkins’ opinion.